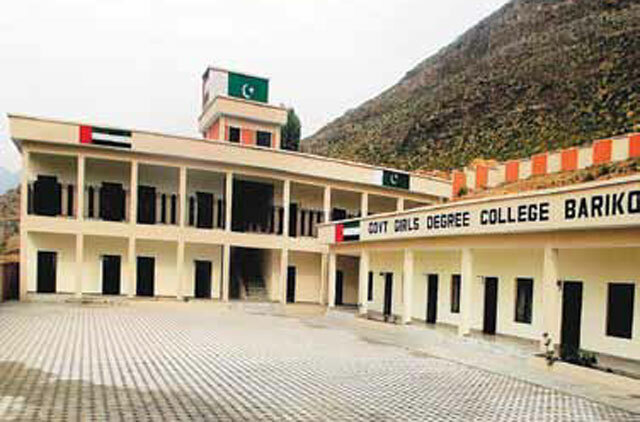 UAE PAP (The United Arab Emirates Pakistan Assistance Programme) started building 52 educational institutes in Swat, KPK (Khyber Pakhtunkhwa) and Waziristan in 2011; within a year it had handed over 40 schools fully furnished with science and computer labs. The institutes include primary, high schools and degree colleges as well as vocational training institutes. Far exceeding local standards of education, all rehabilitated schools are state-of-the-art, and the first of their kind in Swat. Fully equipped computer labs have been provided not only in high schools but primary schools as well. The government of the UAE strongly feels that education is the birthright of every human being, regardless of race or gender, and it is the best solution for the people of KPK to become self-reliant and contribute to their own progress. UAE PAP is building and rehabilitating seven hospitals, clinics and medical institutes, fitted with up-to-date medical equipment, to provide healthcare in flood affected areas. This is imperative because health care facilities have been obliterated due to the massive flooding and disease and epidemics are rampant all over the valley. The reconstruction of these hospitals will accelerate the resumption of medical services to the local population who are in dire need of health care professionals, and help them recover physically from the trauma and shock of the calamity. The UAE PAP has built 64 water treatment and purification plants throughout KPK to bring safe drinking water to people’s doorsteps. Whereas they had to travel to different locations to collect their water, the people of Swat now have the luxury of being able to turn on the tap in the comfort of their own homes. Keeping in mind the fact that the livelihood of the majority of the citizens of Swat is dependent on agriculture and access to markets where they can sell their merchandise, the UAE PAP immediately started work on two main bridges that collapsed during the floods, in order to ensure a healthy recovery for the local economy. Ensuring freedom of movement and medical access to a multitude of people who have been isolated for almost two years, these bridges are expected to revitalise motorised transport all over Swat. Two bridges destroyed by the flood over the River Swat were part of the infrastructure development. Shaikh Khalifa Bin Zayed Al Nahyan Bridge; formerly known as Gammon Bridge, is the longest delta bridge in the world, which was completed in 2012. Shaikh Zayed Bin Sultan Al Nahyan Bridge; formerly known as Shamozai Bridge is an RCC bridge which is set to be completed this year — it’s a mega structure built for heavy and light transportation. The construction of these bridges is being carried out by Frontier Works Organisation (FWO) of Pakistan. A 50-kilometre road has been constructed in South Waziristan to serve as a key trade route for the local population, situated in a remote region of FATA (Federally Administered Tribal Areas.) Occupied by the volatile Wazir and Mehsud tribes, the UAE PAP, together with the Pakistan Army, has taken the first steps to lay out the groundwork of infrastructure in the inhospitable terrain and give the people of South Waziristan a glimmer of hope towards the road to prosperity. The government of the UAE hopes that the road will be the first step on the ladder of progress for these formerly neglected local populations.